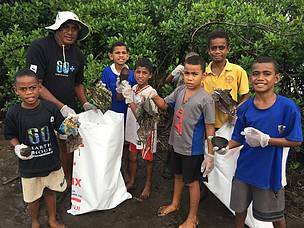 Tavua district representative, Filimoni Caucau with children of Korovou village part of this year's Earth Hour activities. Concerns have been raised by community members of Korovou village, Tavua on the laxity of environment civic pride, by its communities. 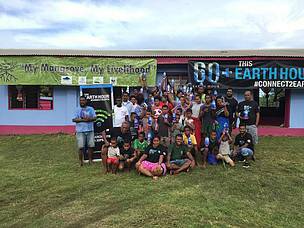 The concerns comes after Korovou villagers, along with a few Tavua corporate stakeholders and WWF Pacific, carried out mangrove planting and waste management activities at Korovou village this morning, in support for WWF’s annual Earth Hour global grass root movement. Over 1,500 mangrove seedlings were planted along with the collection of waste, in and around the village’s mangrove forest, this morning. According to Korovou village headman, Akuila Borisi, the activities carried out this morning is an example and need for a shift in attitude by Fijians not only in Tavua but the rest of Fiji, needs to make. 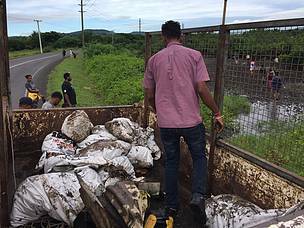 “Improper waste management is also an issue here and we see and read it is a problem all over Fiji. With this activity, this morning, it should at least open our eyes and motivate us here in Korovou and Tavua, to manage our waste, and not depend on external parties to do it for us,” Borisi highlighted. The mangrove seedlings planted this morning will assist in the reduction of the community’s risk of coastal flooding and to also secure the community’s livelihood and food security. Tavua District Representative, Filimoni Caucau highlighted that there was a great need for communities to take ownership in protecting their environment. “This is our environment and we need to take better care of it. It is our responsibility. Last week we engaged our school rugby team to replant, and this was a great start and I encourage every one of different age group to start doing so,” added Caucau. According to WWF Pacific’s Community Development Officer, Apolosa Robaigau, this year’s earth hour theme of ‘Connecting to Earth’ is about shining a light on nature and it importance in conserving it and the sustainable use of it. “Connecting to earth is an opportunity of reflect on the important value of our unique biodiversity that is fast declining and to make strong commitments as an individual, as a family , a community, a company, a town, a nation and one planet to halt the decline in biodiversity and reverse the trend through sustainable practices and circular economy,” highlighted Robaigau. 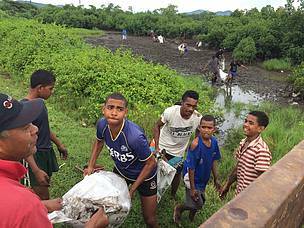 Children of Korovou village loading sacks of rubbish onto the Tavua Town Council's truck. Tavua Town Council officer, waiting for sacks of rubbish to be loaded.